The Olympus LS-10 has a sleek and stylish look. In the hand, it has a smooth, solid and well-crafted feel. At roughly 5" x 2" x 1", the LS-10 can easily fit in a coat pocket. The Olympus LS-10 body is made entirely of aluminum. A nifty tripod socket is on the back, similar to the Sony models. The LS-10 LCD screen is clear and coherent, but many of the fonts are too small for this writer to see without a reading light or reading glasses. The buttons are crisp, responsive and logically laid out. This is a very good assortment of included accessories, but an AC adapter would have been nice. Its long battery life almost makes up for it. 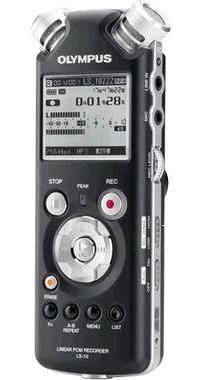 It's easy to make a recording with the Olympus LS-10. Press the REC button once and it goes into REC PAUSE mode. Adjust the mic sensitivity by moving the MIC SENSE switch to 'LOW' or 'HIGH.' Set the recording levels with the REC-LEVEL dial. Press the REC button again and it starts recording. Press the STOP button once and it stops. Press the PLAY/OK button to listen to what you recorded. Easy. The tabbed menu tree is more elaborate than those found on other recorders not made by Zoom, but very clear. Anyone comfortable with a file/menu interface on a computer will figure it out quickly. The Olympus LS-10 has a built-in 2GB flash drive and can accept secure digital media cards up to 8GB in size. If you record mostly to mp3 or wma file formats, the LS-10's built-in drive may be all you ever need. The built-in drive is organized into 6 folders: Folder A - Folder E and "Music." The manual tells us that Folder A through Folder E are for voice recordings. (Huh? Other literature from Olympus acknowledges that some people may want to record their own music too). Upload your favorite tunes to the Music folder when you want to use the LS-10 as a music player. You can "SYNC" with Windows Media Player and transfer your playlists from iTunes. We just recorded everything into Folder A. The separate folders could be a good organizational tool if you have several recording projects going on at once, but you don't need to use them that way. The Olympus LS-10 has a mini USB 2.0 port, 1/8" stereo line and mic inputs and a combination 1/8" line out/headphone jack aptly labeled "EAR." The USB 2.0 connection is very fast - a giant 1GB file transferred to our computer in about 3 minutes. Complete specifications can be found on the Olympus LS-10 web page. 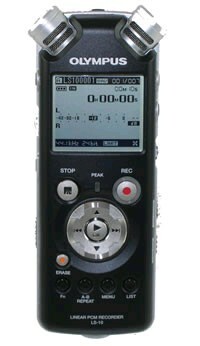 The Olympus LS-10 is the only handheld audio recorder with a stereo speaker monitor (the Marantz PMD620 and Yamaha Pocketrak 2G monitors are mono). The sound quality of the stereo monitor is startlingly clear. Not powerful, mind you, but very clear. This is extremely convenient for checking files without having to reach for another piece of equipment. Excellent. The LS-10 lasted more than 8 hours during our battery life test. Very good. Check out our sound samples and compare the LS-10 to the others. The LS-10 has an impressively low noise floor too. Quite extraordinary for such a little device. Interestingly, the LS-10 manual recommends the 'LOW' mic sensitivity setting for indoor music performances and the 'HIGH' mic sensitivity setting for voice and outdoor music. Follow the recommendations. Initially, we posted a cello sample made with the HIGH mic setting on the main samples page and received a lot of complaints about the lack of bass in the sound. The current sample was made with the LOW mic setting. There still may not be enough bass for you, but the revised sample is a fairer representation of what the LS-10 can do. 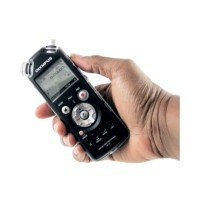 The Olympus LS-10 is a very elegant, well-made and easy-to-use recorder that sounds good too. With its sleek looks you can record anywhere in style. 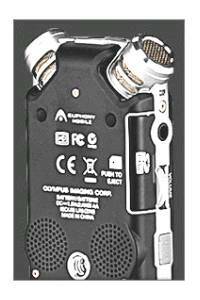 We are happy to add it to our selection of portable recorders.